I was excited at the prospect of painting again with the use of the MAS. For almost a year, I had to rely entirely on my left hand. When Saebo shipped a MAS to my OT facility, I was amazed at the smooth motion I could accomplish with the support. Holding my arm up and moving it around were my biggest issues and the support helped with that. It also decreased the pain involved with both. My own SaeboMAS arrived in early 2014. The first time I walked into my studio and saw it next to my easel, it made me sad that I am now disabled. That emotion quickly disappeared as I began using the MAS and found myself feeling proud and strong each time I put my arm in the straps. 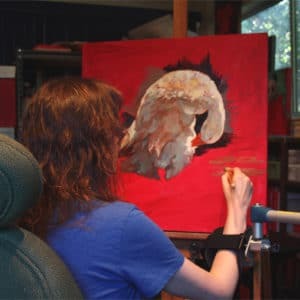 I was painting despite the limitations and the severe pain that it causes my arm and shoulder. I got stronger once I started using the support. It enabled me to challenge muscles that I hadn’t been using much. Slowly, they got stronger and less painful. I returned to eating with my right hand and can do light functions with my right arm. Returning to painting after a year off has changed the way I look at my process and my priorities. I have been experimenting more and trying new techniques. My paintings have gotten bigger and more textured. I’ve also been digging out those photos that I put aside for when I have time or when I’m at my best. I don’t want any regrets. I have a Post-it on my mirror that says, “Paint like it’s your last year of painting”. That is my goal. The Saebo MAS has given me faith that now that I will be able to paint no matter what. When my abilities go up and down I am not scared because I know that the MAS is there for me when I’m ready.